The South African registry was established in 1959. Since 1970 the Boer goat has been incorporated into the National Mutton Sheep and Goat Performance Testing Scheme making it the first goat breed involved in meat production performance testing. The Boer goat is primarily a meat goat with several adaptations to the region in which it was developed. It is a horned breed with lop ears and showing a variety of color patterns. 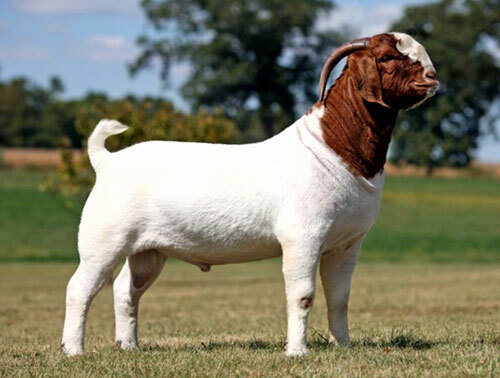 The Boer goat is being used very effectively in South Africa in combination with cattle due to its browsing ability and limited impact on the grass cover. Producing weaning rates in excess of 160% the Boer goat doe is a low maintenance animal that has sufficient milk to rear a kid that is early maturing. The mature Boer Goat ram weighs between 110-135 kg (~240-300 lbs) and ewes between 90 and 100 kg (~200-225 lbs). Performance records for this breed indicate exceptional individuals are capable of average daily gains over 0.44 lb/day (200 g/day) in feedlot. More standard performance would be 0.3-0.4 lbs/day (150-170 g/day). The ovulation rate for Boer goats ranges from 1 to 4 eggs/doe with an average of 1.7. A kidding rate of 200% is common for this breed. Puberty is reached early, ususally about 6 months for the males and 10-12 months for the females. The Boer goat also has an extended breeding season making possible 3 kiddings every 2 years.